Indium Corporation announces the release of Indium10.2HF, a halogen- and Pb-free, no-clean solder paste that is specifically formulated to address in-circuit testing challenges. Indium10.2HF provides low cost-of-ownership to PCB assemblers through all-around balanced performance. 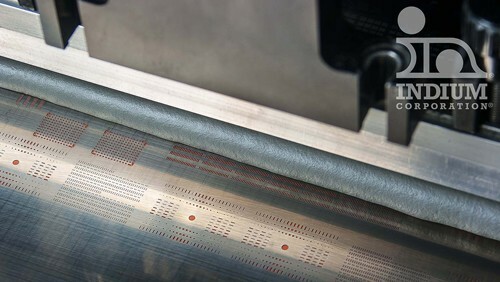 In addition to outstanding print transfer for increased yields, and resistance to head-in-pillow (HIP) and non-wet open (NWO) defects, this no-clean solder paste is ideal for customers who want a clear residue that quickly breaks away after in-circuit testing. Indium10.2HF also helps to Avoid the Void™ by delivering low voiding in QFNs, BGAs, and CSPs. This solder paste is perfectly suited for a variety of printing applications, even with small components. It also has superior HIP and NWO resistance, slump resistance, and ICT/flying probe testability. Indium10.2HF solder paste is part of Indium Corporation’s family of high-performance, lead-free, low-voiding, no-clean solder pastes that help manufacturers Avoid the Void™. For more information about Indium10.2HF, email askus@indium.com or visit www.indium.com.